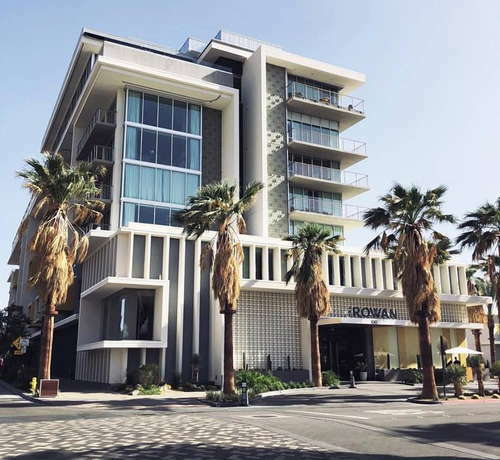 One of the newest arrivals on the Palm Springs scene is the Rowan Palm Springs, a downtown property from the Kimpton chain of boutique hotels. With awesome sunset views from the rooftop bar and adjoining restaurant, the hotel’s dining and drinking spots have quickly become where both locals and tourists flock to. The hotel, geared toward younger travelers but welcoming to all, has dazzling views from the picture windows that are seemingly everywhere. 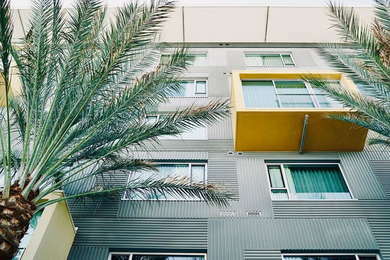 YOU SHOULD KNOW In addition to the room rate and taxes, each night’s stay has a $35 resort fee tacked on. 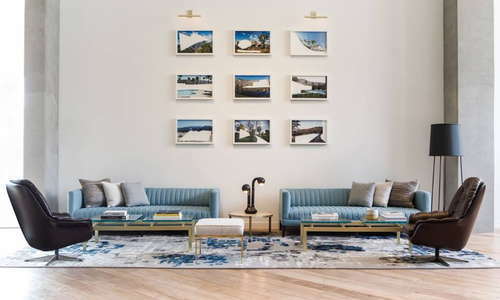 The fee covers valet parking, golf bag storage, in-room WiFi, and use of the hotel’s bikes. 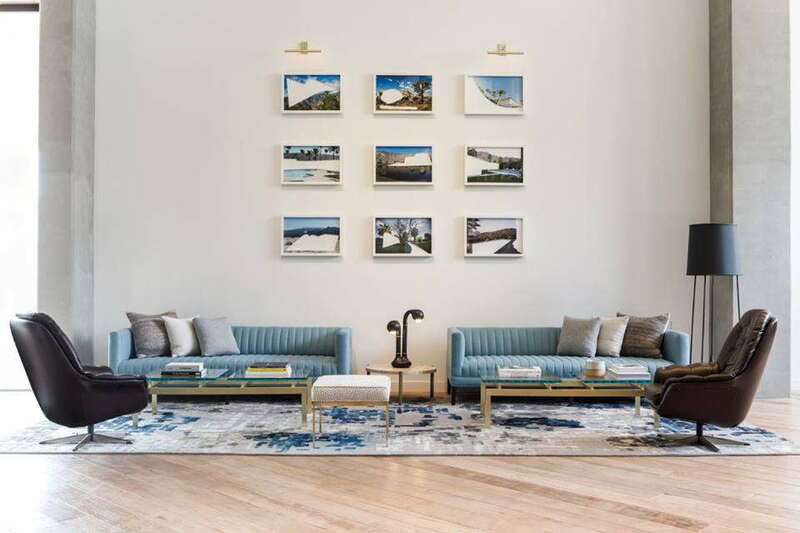 The 153 guest rooms and suites all offer Wi-Fi, floor-to-ceiling windows with terrific views, and—as fans of Kimpton hotels will expect—a yoga mat in every room. The hotel is pet-friendly, but, keeping those with allergies in mind, also has rooms that never host a four-legged guest. 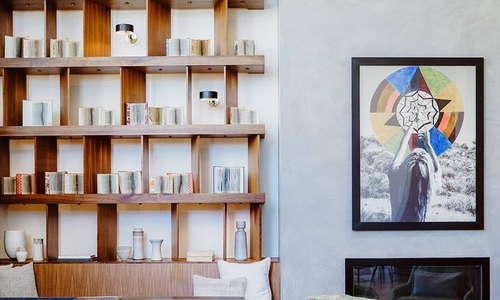 The decor is modern, with monochrome spaces and hints of color. Featuring a cool, blue-gray tile, bathrooms are modern, with crisp lines, chrome fixtures, and white vanities and tubs. Spa rooms include deep soaking tubs but all of the bathrooms have a spa quality to them and are stocked with Atelier Bloem bath products. 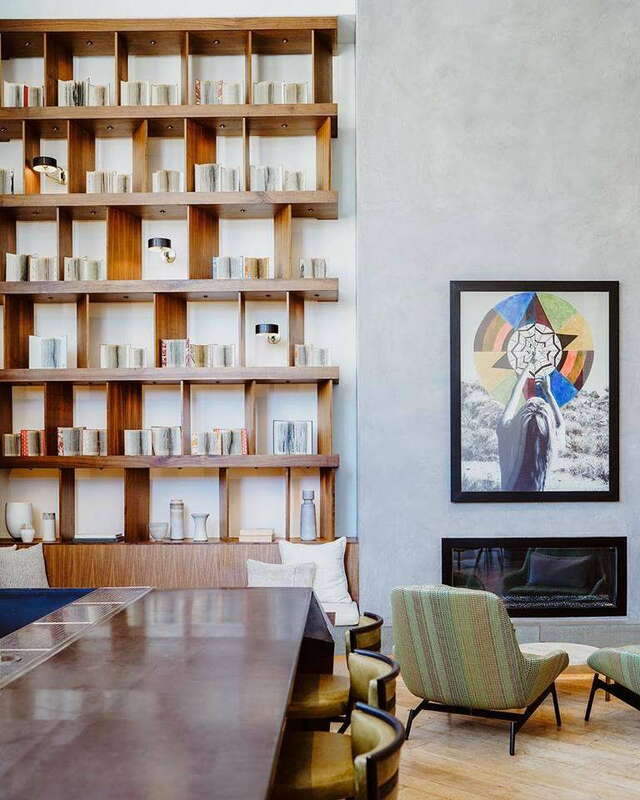 The lobby, an angled space with clean lines, wall-to-wall bookshelves, and a seating lounge, plays up the desert location with a peekaboo view of palms, pines, and mountains. 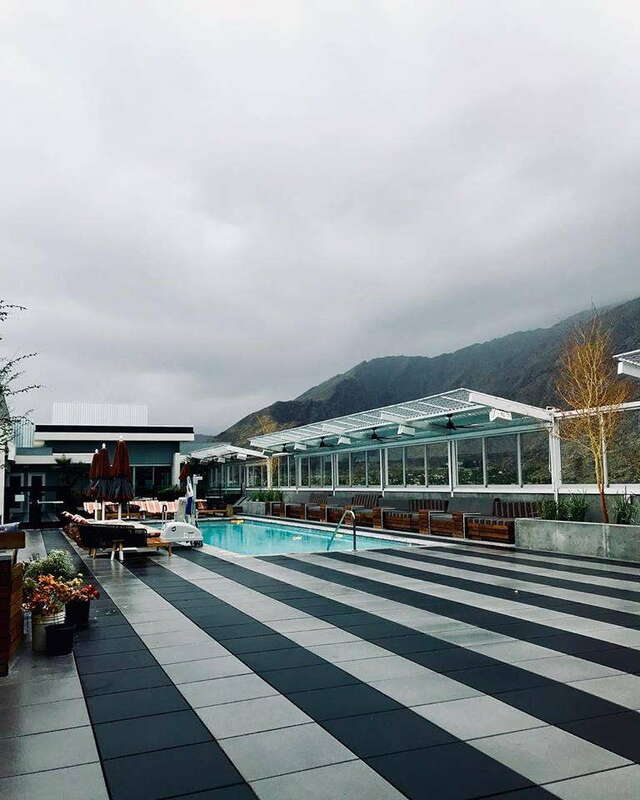 Allegedly the only rooftop hotel pool in Palm Springs, the Rowan’s shallow swimming pool offers guests a peek at the sublime San Jacinto mountains from the water or a nearby deck chair. Cabana rental is also available and guests can imbibe at the High Bar during the day or the intimate Four Saints at night. The well-stocked fitness center hosts expected equipment like free weights, stationary bikes, and cardio machines, but also additional treats for gym rats, like medicine balls, BOSU balls, resistance bands, and, another Kimpton favorite, hula hoops. The rooftop restaurant, 4 Saints, is a scene and a place to be seen, but is open for dinner only. The dishes, intended to be shared family style, boast offerings from countries all around the Mediterranean from Europe to Western Asia to North Africa. 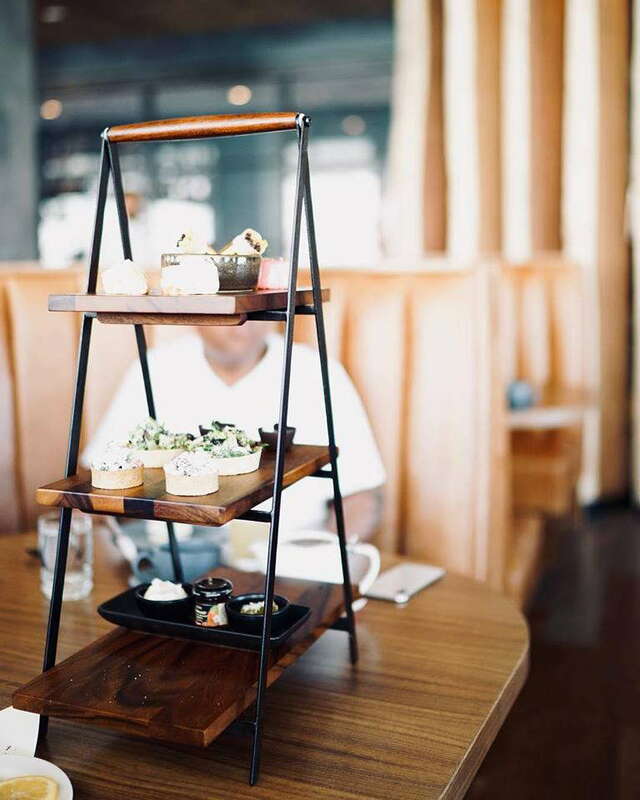 Juniper Table, also serving lighter plates of Mediterranean cuisine, is open for breakfast, lunch, and early dinner (the restaurant closes at 9 p.m.). 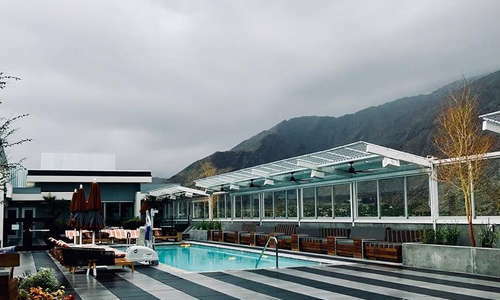 With daytime poolside service and weekend evening hours open to the public, the aforementioned High Bar on the hotel roof is a veritable hotspot. 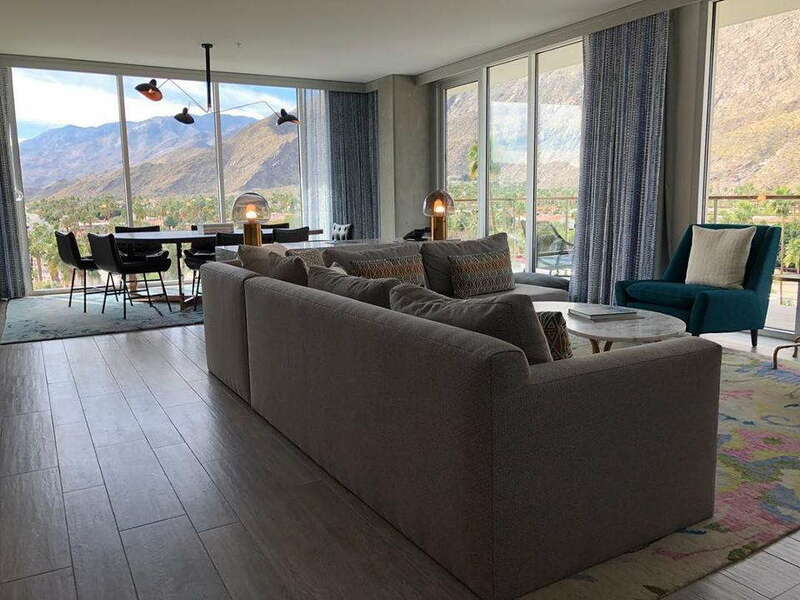 The lobby level Window Bar offers its own special sauce, however, with a peek of the desert-meets-mountains Palm Springs landscape and a cozy living room vibe; it is adjacent to the Rowan’s lobby area. Though parking is valet-only, the Rowan is located in the heart of downtown Palm Springs. It’s a quick walk to in-town restaurants, bars, and attractions, like the Thursday night VillageFest. Travelers can hop on and off free BUZZ shuttles that roll through the downtown area every 15 minutes during the day. A car is definitely needed for out-of-town excursions, like Joshua Tree National Park, the Aerial Tramway, or destinations further down valley. Pomme Frites (5-minute walk) offers elegant Belgian fare and wonderful Belgian beers. Meanwhile, Sherman’s Deli & Bakery (6-minute walk) is the spot for latkes, reubens, giant slices of cake, and all your diner or deli dreams. 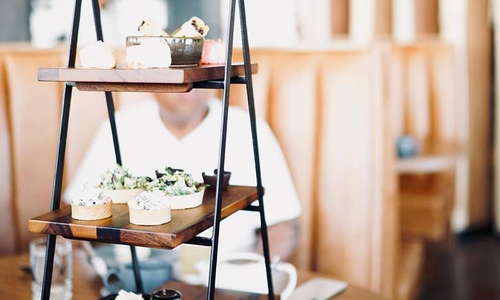 A favorite among locals and tourists alike is Lulu California Bistro (4-minute walk), with spectacular multi-course brunch and multiple happy hours. No trip to Palm Springs is complete without tiki and The Tonga Hut Restaurant and Tiki Bar (5-minute walk) doesn’t disappoint. Get your dive bar fix at Hair of the Dog (5-minute walk), a low-key spot with a great happy hour. Blackbook (7-minute walk) is a sleek, gay-ish bar with an entire wall of whiskey options. The rooftop bar, pool, and restaurant tips the scales on this downtown gem, but we also adore the approachable decor and friendly service. 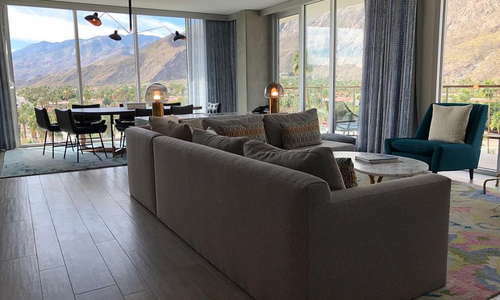 Though the offerings at the Rowan Palm Springs are all top-notch, it’s also unpretentious and puts guests—especially those under 40—at immediate ease.